With the recent rapid increase in the number of 'bean to bar' chocolate makers across America, it is becoming more and more difficult to find uniqueness among the masses. But Washington State's Fresco Chocolate is definitely doing things differently. I've had my eye on this chocolate maker for some time, just waiting for a chance to try their unique line of chocolate bars. Why so unique? Unlike many others, chocolate maker, Rob Anderson, produces several different chocolate bars out of the same origin of cacao (cocoa beans). On his website's main page, you can see how many products you can buy made from each cocoa origin. For instance, you can buy four different chocolate bars made from beans grown in Papua New Guinea, and five bars from the coveted Peruvian Maranon beans. You might be we wondering: Why so many products from the same beans? Fresco so correctly believes that "Heat, motion, aeration & time produce chocolate's final flavor; this is conching. Adjusting these variables can produce dramatically different flavors." This is true: change any one variable, such as the length of refining, or 'conching' as it is called, and the final chocolate flavour will change. The same applies to the roast level (i.e. dark versus light) or even the year of the cocoa bean harvest. 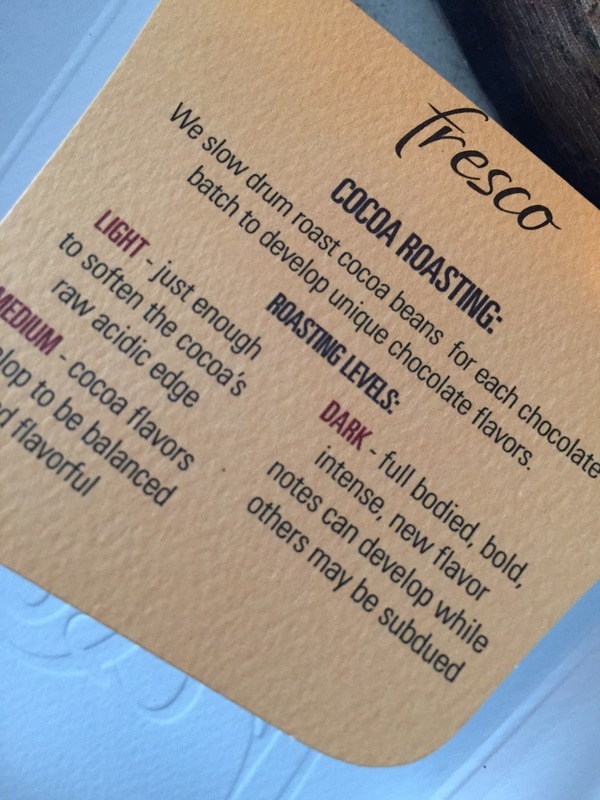 Fresco is essentially teaching its customers how each variable in the chocolate-making process affects chocolate flavour, by way of tasting Fresco's products. By making two or three chocolate bars, each with a different roast of the cocoa beans (light, medium or dark roast) or conching length, the chocolate consumer can learn by tasting to discover the differences in flavour. It also helps in 'palate training', so that next time he or she tastes a chocolate bar, they can identify how heavy the roast may be, and look beyond to discover the other naturally occurring flavours within the chocolate. This week, I am armed with 12 of Fresco's amazing chocolate bars, made from four different origins: Peru (Maranon River Canyon), Madagascar, Peru (San Martin), and Papua New Guinea. But tasting this many chocolates, with varying conche and roast levels, is a colossal task. So I have decided to turn this review into a four-part series, so I can focus individually on the taste of different roasts, different conche times and harvest years, as well as a separate discussion of Fresco's 100% chocolate bars. So stay tuned tomorrow for the first part in this four-part series exploring Fresco and the different variables of chocolate making! Early on in tasting Fresco I was literally blown away by the difference between 209 Jamaica and 210 Jamaica! Everything was exactly the same, except that the conche was changed from subtle in 209 to medium in 210. But the tastes were astoundingly different! I rated the 210 at 9.5, which is among the highest Top Favorite I've ever had, but I rated 209 a mere 6 (Above Average). Changing that one variable made the bars that different! Astounding!